So a half day of biking did me more good than I realized. My legs felt a whole lot better the next day! Apparently I missed the memo and some of the group left a bit earlier than I expected, so I left with a later group. The morning for this ride was great! My legs felt fresh, the terrain really wasn’t all that tough, and it was just a fun morning cruisin the coast. Really not a whole lot to say except that it was a fun morning riding with a few new friends, Robert and Paul. May have pushed a little too much in the morning though, cause I felt it the next day. We stopped for lunch and enjoyed some brats. We ate at a picnic area in a park and all got there pretty early. This was the last time we would all be together, so we took some time where Yvette, who pretty much runs the ride thanked everybody one by one with some fun little gifts from the dollar store. We also talked about the route for the afternoon and the next day, and then were surprise bombed with water balloons by the SAG crew at the end of the lunch. As we all head out from lunch, I decided to head out as quick as possible. I figured if I could start out at the front of the pack, I wouldn’t end up at the back by the time we got to Malibu. The second half of this day wasn’t quite as simple. As we rounded the coast on highway 1 toward Point Magoo there was a fierce headwind to fight against. After a while of pushing against it, I decided to slow down a bit and just enjoy the ride. After a while, a few friends, Derek and Greg, came up on me. They invited me to join them as we took turns drafting and leading. I hung with them for a little bit, but before too long, I could tell I was pushing pretty hard to stay on their wheel, so I decided to drop off and told em to have fun. The rest of the ride was beautiful, and was definitely different riding into Malibu. You could definitely tell we were in Southern California beach town territory now. Riding by cars on the beach and what not. Several small but definitely noticeable hills as we rode through Malibu and up to Pepperdine where we ended the ride at Malibu Bluffs Park. 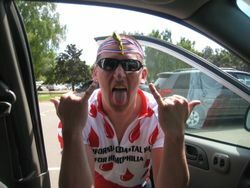 I ended up riding in around #10ish of the 18 or so riders that day, so my leaving up front idea worked out pretty well. With the exception of the really fast guys on the trip who pretty much bombed through every day, a lot of the riders kinda chose different paces on certain days. On some days there were guys who smoked me who perhaps came in behind me other days cause they decided to kick back more on that one. It was nice to enjoy the rides and kinda decide how hard to push based on how you were feeling and what not. Gave me some time to change my clothes, have drink, and cheer the last several riders in for the day. From there we stayed in Malibu for dinner, which we arrived at around 4pm. They’ve struggled to safely get everyone though L.A. in the past, so now they shuttle from Malibu down to Dana Point to finish off the ride. But that drive on a Friday afternoon is insane traffic wise. So we ate at a restaurant on the beach in Malibu, enjoying the outdoor patio, and I finally saw Rachel again at about 8:30 that night when we arrived at Marina Inn in Dana Point. Dana Point to San Diego…the finish line!!! This turned out to be a bit of a rough day for me. I think most everyone had “that day” and this was pretty much mine. Factor in that it is the last day and my legs were pretty much toast along with some other challenges thrown it, and it was a long one for me. 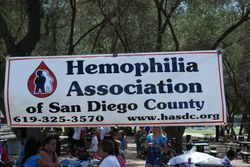 The plan was to ride the full 70+ miles without a lunch stop, leaving early that morning because we were scheduled to arrive at the San Diego chapters annual picnic between 1:30 and 2. So we all ride to a sports bar called McGregor’s near the stadium to have some drinks and food and regroup so we could all ride in together. So, I left probably around 6:30 if I remember correctly, with 4 or 5 other riders toward the back of the crew, with only one or two small groups to leave behind us. Right off the bat we missed a right turn that wasn’t very well marked, and ended up about half a mile off route. We slowly figured out how to get back to highway one, and were now in the back for sure. We rode for a bit, and then hit an area where we follow bike route signs through a bunch of back streets. Jim and Derek came up from behind and started riding with us for a bit, too. As we passed a park, I saw a restroom, and let’s just say my stomach was not agreeing with me that morning, so I decided to make a quick pit stop. Virgil saw me stopping and offered to wait, but I told him to go on ahead and I’d catch up. Well, I hit the road, and followed the signs, but managed to miss a final turn somewhere and now I was way lost. Tried using my phone to figure it out, had issues with that, started moving the direction made sense figuring if I kept the ocean on the right I’d eventually get on track, stopped again not wanting to go under the highway, and then finally asked another biker I saw if he knew how to get to the bike path through San Onofre. He was heading that direction and I was now back on the route card and good to go. As I was riding through San Onofre beach camping areas I ran into the crew I started with stopped at a bathroom, and rejoined em here. So we kept on rollin. Ultimately, I could tell I was moving a little slower today, but I could not get my legs to push much faster, and we were mostly moving at the same pace anyway, so it was all good. We hit the gate to Camp Pendleton, where we stopped for some nutrition at a SAG truck before showing our ID to go through the base. Keep in mind this was a Saturday morning so the roads were packed with riders. We left so early that it was still pretty early, but I could already feel the heat setting in. I had no idea at this point just how warm it would get. Two things about Pendleton. First, at one point I actually found it quite moving. We’re riding through the Marine base, and on the fence I see a couple signs welcoming home troops. I saw one large sign from a daughter, basically saying, “Daddy, look how much I’ve grown while you were gone!” Very moving and made me very thankful for these families and the sacrifice they make. he flat, so I got rid of that, and we were back on the move again. The rest of the morning was just hammering out miles and enjoying some time chatting with Virgil as every hill we hit in his words, “sucked out a piece of his soul.” There was one final, fairly lengthy climb when we hit Torrey Pines in San Diego. Luckily I was mentally ready for it, and it’s about a mile and not too horribly steep, so it was slow going and some work for sure, but not horrible at all. From there the rest of the ride was just difficult cause it was stinking warm, and getting warmer. Toward the end I stopped a few times to fill my bottles with ice and within 10 minutes it was already melted and warm again. I found out later that the high where we rode into at 1:30 in the afternoon was 104 degrees! At one point as I was driving down Kearny Villa Rd with the hot asphalt radiating up into my face, I swear the breeze felt like someone had turned on a hair dryer. Well, we rode through the parking lot at the Q (will always be the Murph to me) and finally were the last 3 or so to arrive at McGregor’s, and I was so happy to be done! Hung there for about 20 minutes before we all saddled up to ride into Admiral Baker Park together. The idea was for the aid vehicles to go ahead and to prepare everyone for us to come in. Communication must have broken down some where and we made a short climb ti the descent into the park. I rode toward the front and joked that I was gonna tell my fam that they placed us in order of where we placed by average throughout the week. As we rolled down into the park, we saw that no one was there to greet us, and as we got there they started walking over from the food area about 500-600 yards away, as if we had caught them by surprise, which we pretty much did. Kinda anti-climactic, but it was awesome to be at the end nonetheless. We posed for some pics as a group and then, I was greeted by my wife and kids, mom, and sister’s fam. Rachel and Caleb had bought a dollar store trophy and some finisher medals for me, along with some Sourpatch Kids as a congratulations on finishing. And there ya have it. Here are a few pics from the picnic, and I’ll try to get up another post with a reflection or two before the blog gets back to normal. Thanks for following the journey! I would find myself fantasizing about Marty figuring out that I was perfect girl for him and that we would ride off into the sunset together. WOW! I’m jealous and impressed! I wish I could get back in shape to do that sort of thing! I used to do long rides but college and now life has gotten the best of me! No time like now to flip that around eh? 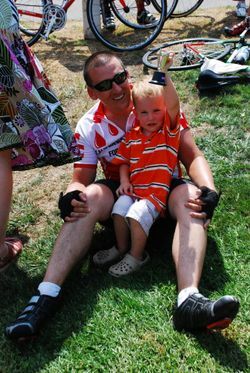 Thanks BObby, for sharing your thoughts and feelings as you’re doing the ride! So interesting! We are so very proud that you would do all this to support such a worthy organization! Love you!